These are for 1970’s Motobecane mopeds with type AV7 (1970’s versions). Motobecane Crankshafts: are the same for variator and non-variator pulley-clutches. Top is used, pre-1980, shorter right side threads. Takes special 16mm bearings 6302QR 16x42x13. 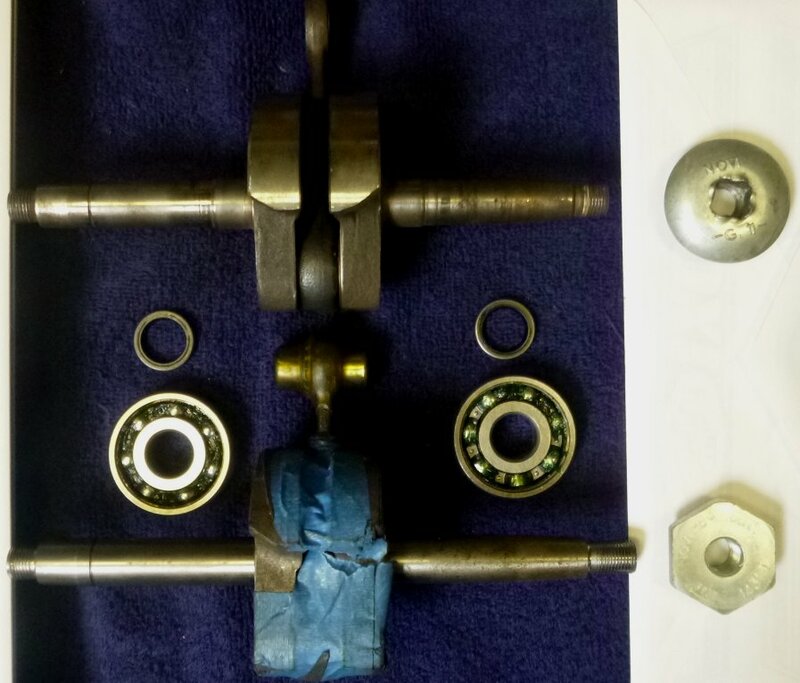 Bottom is new 1980-later original, machined to 15mm at bearings, to take ordinary bearings 6302 15x42x13. Myrons offers new pre-1980 crankshafts, that take special 6302QR bearings. But Myrons does not offer the special bearings for the original cranks. Instead we offer a new original 1980-later crankshaft that has been machined from 16mm to 15mm at the center where the bearings press on. The press fit is precise and correct. The piston pin and needle bearing are new, included, and factory sealed in wax, that peels off. Two 6302 bearings, and two 15x21x4 seals are included. Price is $180. It is long enough to take the 1980-later hex nut, sold separately at $10. But it will also take the pre-1980 square-hole nut, if the extra threads are ground off. This entry was posted on Wednesday, January 16th, 2019 at 6:22 am and is filed under Motobecane Parts. You can follow any responses to this entry through the RSS 2.0 feed. Responses are currently closed, but you can trackback from your own site.